SEE A CLIP OF THEM HERE! Recording artists and jazz stage headliners Mardra and Reggie Thomas will be bringing their intimate and inspiring tribute to jazz legend Billie Holiday to Hannibal as part of our 2018 Fundraising Gala. If you’ve attended our fundraisers in the past, you’ll know that what a great experience it is. 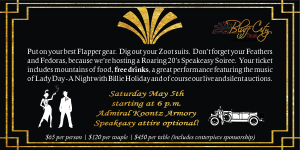 This year’s theme is a Speakeasy Soiree- a tribute to the Roaring 20’s and we’ll have a ton of surprises for you. It all takes place Saturday May 5 beginning at 6 p.m. at The Admiral Koontz Armory in Historic Downtown Hannibal! Enjoy an evening with the music of Billie Holiday, featuring the husband and wife duo of Mardra and Reggie Thomas. Saturday May 5th only! With local restaurants once again providing their signature dishes you’ll enjoy mountains of food. This year, we’re including free wine, beer and soft drinks with the price of your ticket. We’ll have great live and silent auction items you can bid on, all courtesy of local businesses and our donors and sponsors. Tickets are on sale now. Enjoy an entire evening including dinner, drinks and world-class entertainment for just $65 per person or $120 per couple. Or, put some friends together and purchase an entire table of 8 for just $450! Buy online or call Bluff City Theater at 573-719-3226. Next article Auditions at Bluff City Theater this weekend! Don’t miss your chance! Final Performance of The Heiress-Today at 2:00 p.m.